I cannot claim this one to be ‘photography’ in any proper sense. This is a phone shot and, given that my phone is pretty ancient, the photographs it takes are not up to much even by phone cam standards. So, think of this as just a record of the event: the annual Bruton Spiral of Light festival in Somerset. Spiral of Light started life as a fund-raising function on the part of the now disbanded Meadow School in the town. Locals enjoyed the event so much, however, that it has continued with a life of its own. What you see here is a hill with an old folly – The Dovecote – on top of it. 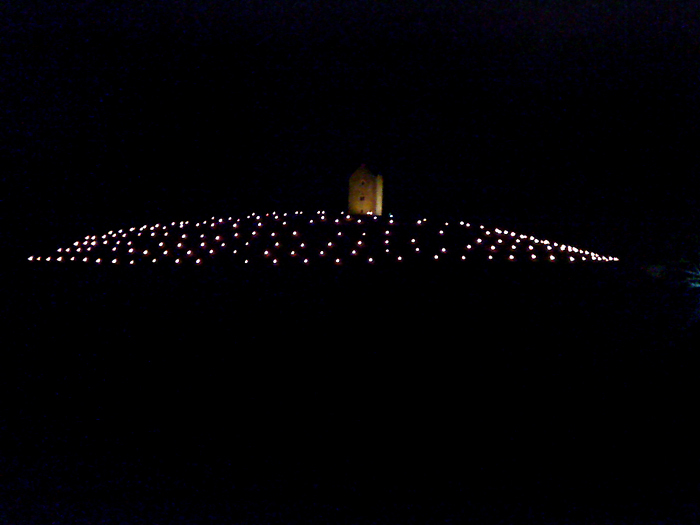 Flares are placed around it, appearing here as light dots against the dark hillside. At the bottom of the hill a little fair takes place, involving food, mulled cider and fire jugglers. The culmination is a fireworks display, which, for a small place, was some way beyond amazing. It could well be one of the best fireworks displays I have ever seen.